I absolutely love teaching poetry! That explains why I teach it ALL year! 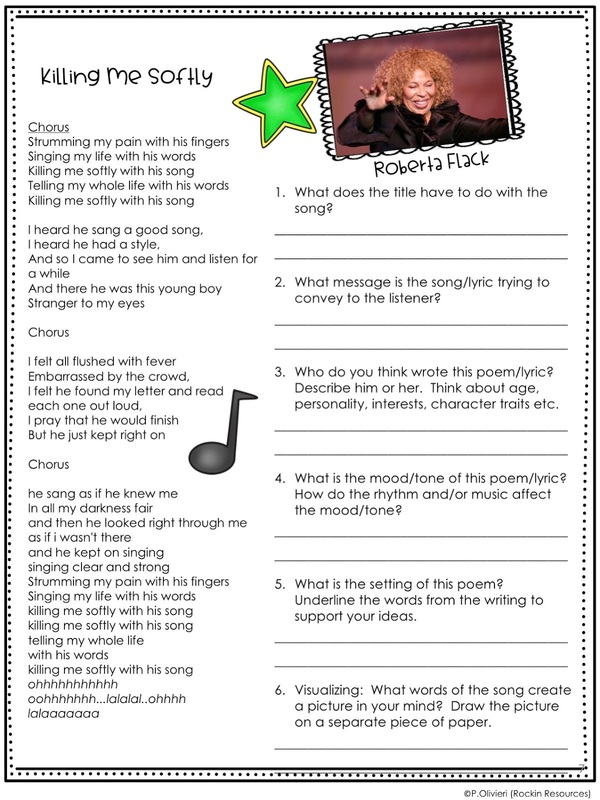 Each month I focus on TWO types of poetry and then during POETRY MONTH, we review all of our work, create poetry portfolios for a review, and have a POETRY SLAM! Read on for details! 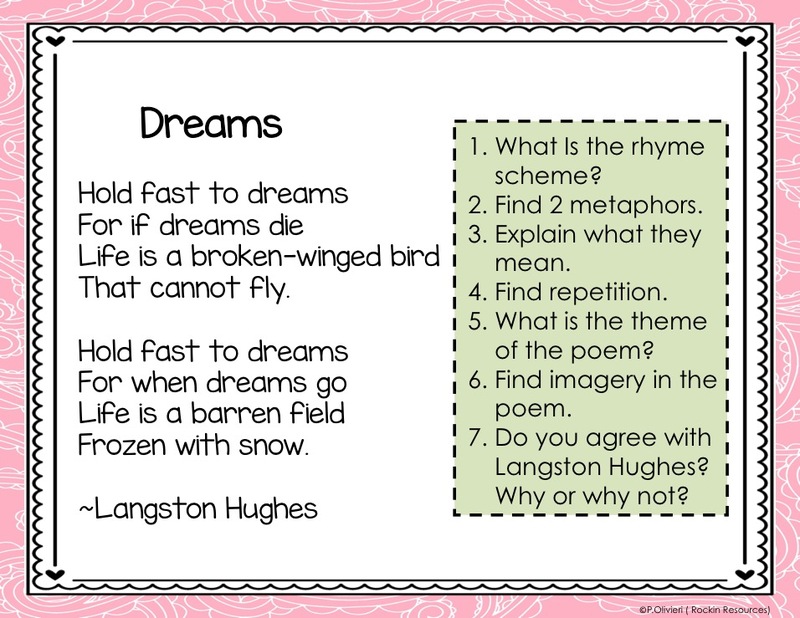 At the beginning of the year, make a bulletin board to display posters of the different types of poetry. Leave a space below each one to place a student example. Review it with your class and tell them by the end of the year, they will have written an example of all the types. For the time being, put a little sign under each type of poetry that says something like, "Under Construction" or "Coming Soon!" I place a large 12" X 18" black piece of construction paper under the posters. 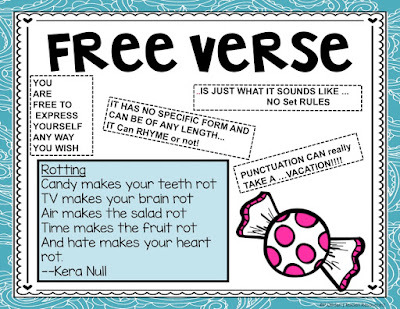 Each month, introduce a new type of poem and teach the rules for that poem. 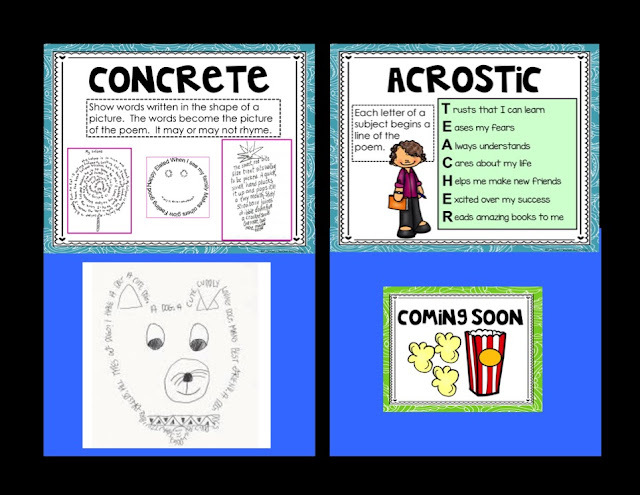 If you created a bulletin board like above, add a student example. The following order works well for upper elementary! In addition to introducing a new type of poetry each month, also choose a poem or song to analyze each month. I actually try to do two of these a month - one regular poem and one song to analyze the lyrics. Students love the musical feature and I start to see them wiggle in their seats and try to sing the songs. I allow them to sing and even dance to the songs. 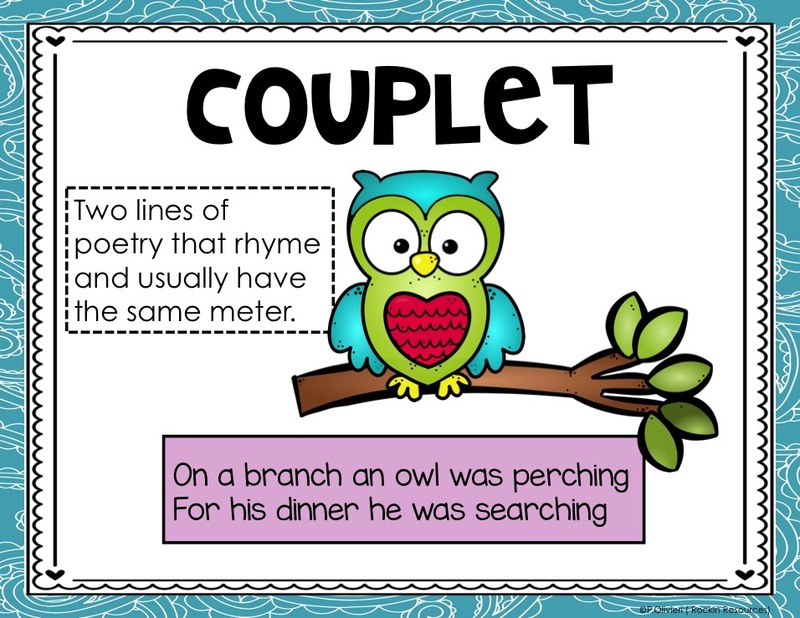 Any little thing to get them excited about learning poetry! I love when they say, "My dad likes that music!" or "Who is that?" 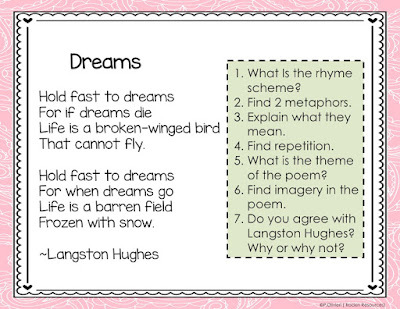 Use the following elements of poetry when analyzing poems! Alliteration- Ex. Slimy slugs slither slowly on the sidewalk. Imagery- Ex. The thick fuzzy coat was a blessing in the winter blizzard. Metaphor- Ex. A good laugh is sunshine in a house. Onomatopoeia- Ex. Bang, ding, pop! Personification- Ex. The wind whistled its happy tune. Simile- Ex. She was as pale as a lump of sugar. 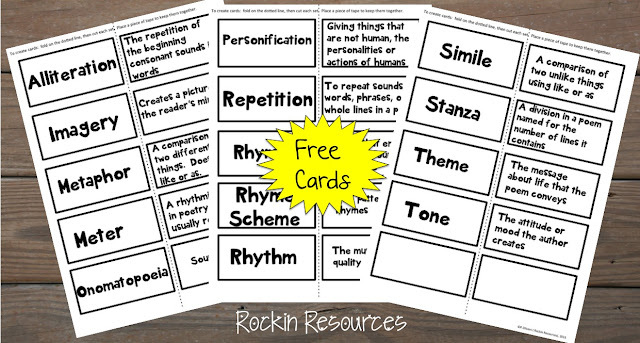 Grab these free poetry study cards! At the end of the year, I like to have students create their own Poetry Portfolio. Basically, they get out their notes from throughout the year or I supply them with directions. 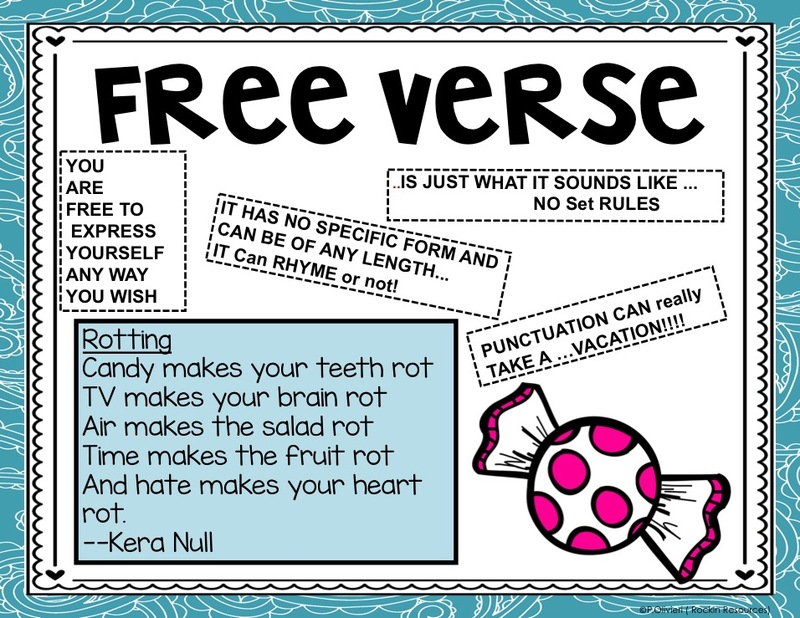 Since it is a review, I don't usually teach the rules for each of the poems. I either give it as a class project in centers or homework. If you don't have time for your class to write new poems for each different type, save the poems throughout the year and create a portfolio of poems. Finish off the year with a Poetry Slam! Oh yeah! 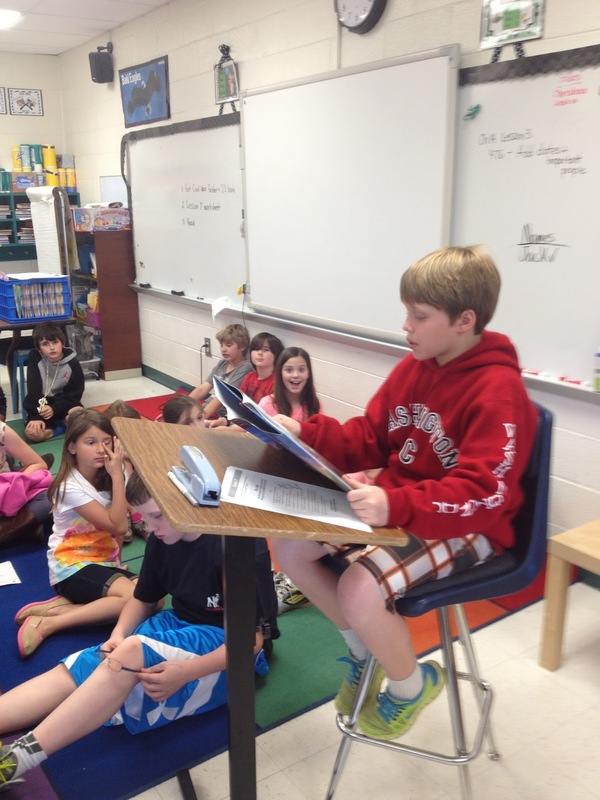 Students love to share their work and this way they can show ownership and pride of their hard work. 1. 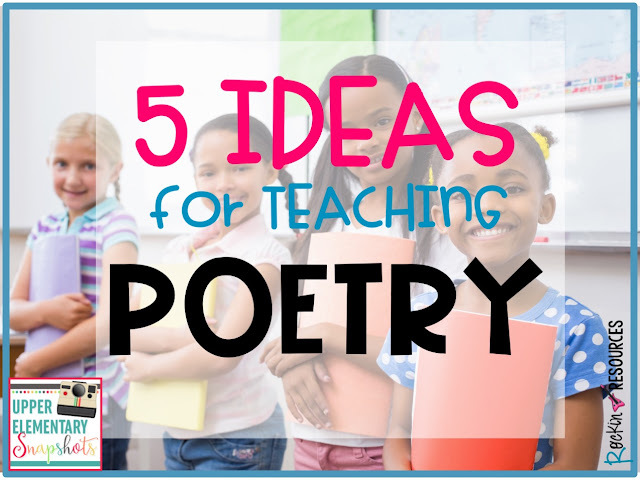 Allow your students to relax around the room and enjoy listening to poetry from their fellow classmates or set up chairs for them. It can be formal or informal! 2. Set up a schedule so students know the order of when to share their poems. 3. Have a special author's chair? Use it! 4. 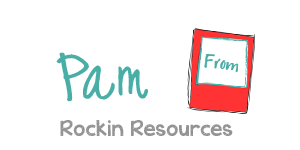 Do you have iPads, tablets, video cameras? Have the student videotape! I have my students rotate. After they present, they go to the video chair. That way each student gets the experience of both being the videographer and the presenter! AND parents absolutely love to see these videos! Thank you for visiting! Come back to get some more amazing ideas from Upper Elementary Snapshots!!!! 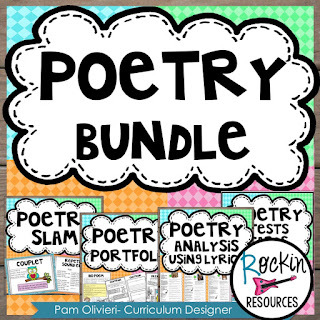 If you need poetry resources, click below! They are sold separately too.